These lamps are beautiful in person. They are exactly as pictured online - the bluish toned grey with bronze-gold accents is accurately portrayed. The lamp shade is plain white, as pictured, but has a nicer quality fabric than the shades I usually buy at Target, Lowes, or World Market. It comes disassembled and very well packaged. The only odd part of assembly is that the cord that runs through the lamp gets wound inside the lamp as you try to screw on the bulb assembly. So I thought there must be a way to loosen the bolts in the bulb assembly, but there was not really a way to screw it into the lamp base without the wire twisting and getting tight, building tension, and unscrewing itself when you let go. So I pushed some of the cord back into the base from the bottom and then tried twisting it in the same direction as I had screwed on the assembly, while simultaneously pulling it back through the bottom hole (if you get one, you'll understand). That seemed to allow the cord to unwind. Essentially you just need to leave the cord slack inside the base while you screw everything in, and then twist the cord as you pull it through the bottom to release the twist from being inside of the base. The directions even tell you to be careful not to allow the cord to become twisted inside of the base. Once I managed that, the bulb assembly stopped unscrewing itself and stayed put. The harp, shade, and finial sit beautifully atop the base. I never appreciated how well made a lamp could be until I felt how strong and well held in place the harp was. Some lamps I've owned in the past will bend and the shade won't be level, but this one is very straight. 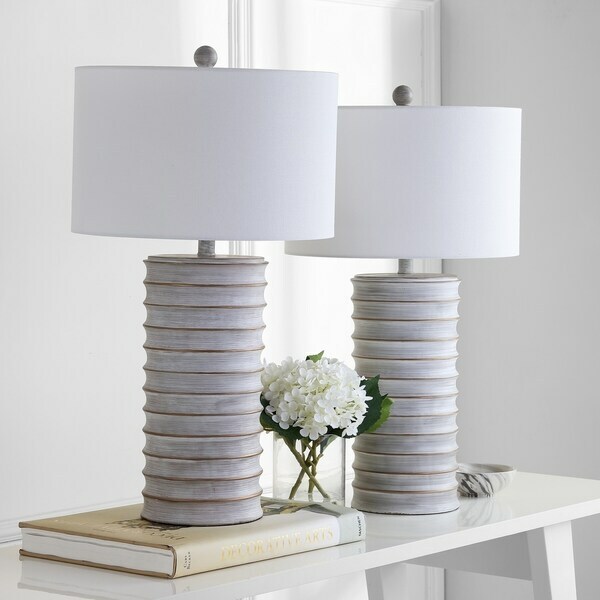 As others have stated, these lamps are large, so I'd check out the dimensions and look at the dimensions of whatever table/surface you're going to be placing them on. Highly recommend based on aesthetics and construction. Safavieh Lighting 28.5" Brixton Table Lamp - Brown / White - 15" x 15" x 28.5"
Classically elegant, this set of two table lamps makes a dramatic statement in the living room, bedroom, or entry way. Its white wash finish adds a rustic touch to any modern décor. Dimensions 16.0 In. X 16.0 In. X 28.5 In. These lamps are beautiful. They are large so be sure you have the proper space. They are used in my master BR with a K bedroom suit and they look great. I would definitely recommend these lamps. Excellent quality for the price. Looks just like photo. Shades are white. Others mentioned shades were dented but mine were fine, no problems at all. Glad I bought them! These lamps are just what I was looking for. They are grey with more of a gold rub on the edges. They are a substantial size too. The only problem I had was one of the shades was damaged. These tamp lamps exceeded my expectations. First, the size is huge! They look amazing on our nightstands. However, if you have round or small nightstands, I would advise against purchasing them. The rustic look is perfect and they are super bright. Definitely one of my favorite purchases. This lamp is made of poly resin.